The public’s views of the nation’s economy have shown little change throughout 2015. But Americans are less optimistic about how well the economy will fare over the next year than they were last January. Currently, 45% rate economic conditions as only fair, while 27% view them as excellent or good, and about the same percentage (28%) rates the economy as poor. While these attitudes have changed little over the past year, they have gradually improved over the past seven years. In fact, opinions of the national economy today are quite similar to views in January 2008, before the financial crisis later that year. At that time – the start of George W. Bush’s final year in office – 26% expressed positive views of the economy; by the fall of 2008, in the aftermath of the financial meltdown, positive economic ratings had plummeted to 7% – and remained in single digits for more than two years. The latest national survey by Pew Research Center, conducted Dec. 8-13 among 1,500 adults, finds that most Americans (54%) expect that economic conditions a year from now will be about the same as they are today, while similar shares expect the economy to get worse (22%) or better (20%). That represents a change from January of this year, when economic optimism was on the upswing. At that time, 31% expected the economy to get better over the coming year, compared with 17% who expected it to get worse (51% expected little change in economic conditions). Nonetheless, Americans are somewhat more likely to say their incomes are keeping pace with the cost of living than they were at the start of this year. And perceptions of local job availability continue to modestly improve. Currently, 42% say their family’s incomes are staying about even with the cost of living, up from 37% in January. 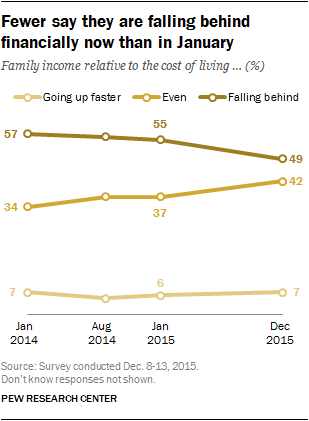 Nearly half (49%) say their incomes are falling behind, down from 55%. As was the case in January, very few people – just 7% currently – say their incomes are actually going up faster than the cost of living. About four-in-ten (41%) say that there are plenty of jobs available in their communities. While that is little changed from May (40%), these represent the most positive evaluations of local job conditions in eight years. Fewer Americans (33%) say there are plenty of good jobs available locally, though the share saying this has increased seven percentage points since August 2014 (26%). As in the past, there is broad public support for raising the federal minimum wage from its current level of $7.25 an hour: 73% say they generally favor increasing the minimum wage, while 24% are opposed. When those who support raising the minimum wage are asked, in an open-ended format, to what level it should be increased, they offer a wide range of responses. Based on the overall public, about 20% volunteer a level of less than $10 an hour, while 26% give an amount that falls between $10 and $11 an hour; 14% volunteer an amount between $11 and $14 an hour, while 11% say it should be $15 an hour or a higher amount. As is typically the case, Republicans and Democrats have very different attitudes about the national economy. Currently, 38% of Democrats say national economic conditions are excellent or good, compared with 22% of independents and 21% of Republicans. Democrats’ views have changed little over the past year, while Republicans express somewhat more positive views of the current state of the economy (21%) than they did in January (14%). Democrats’ expectations about the future economy have fluctuated in recent years. Currently, just 24% of Democrats expect the economy to be better a year from now; that is down sharply from 44% in January. Republicans, by contrast, have been consistently more gloomy in their expectations for the economy. Currently, just 16% of Republicans expect economic conditions to be better a year from now than they are today, which is largely unchanged from January (19%). The last time more than a third of Republicans (35%) expressed optimism about the national economy was in September 2012, two months before the 2012 election. Democrats were even more optimistic at that time (58%), but unlike the Republicans, remained upbeat about the economy’s future, at least for a few months after the election. By March of 2013, however, just 40% of Democrats expected the economy to improve over the following year. There also continue to be education and income differences in views of the nation’s economy – though these gaps are far less pronounced when it comes to views of how well the economy will fare over the next year. About four-in-ten with a postgraduate degree (39%) say the economy is either excellent or good, while just 11% rate it as poor. Among those with a high school education or less, about as many rate the economy positively (27%) as say conditions are poor (33%). Similarly, those with family incomes of $30,000 or less are almost twice as likely as those with incomes of $100,000 or more to view current economic conditions as poor (35% vs. 19%). However, economic expectations for the coming year vary only modestly by education and income. Adults with incomes of at least $100,000 are no more likely than those with incomes of less than $30,000 to say the economy will better a year from now (24% vs. 22%). People’s views of their personal finances – as well as their expectations for the coming year – have shown little change in recent years. Currently, 43% say their financial situation is excellent or good, 39% say it is only fair, while 17% rate their finances as poor. Most adults (61%) expect their financial situation to improve at least some over the next year. As always, there are wide income and education differences in views of personal finances. But while 66% of those with high family incomes ($100,000 or more) expect their finances to improve, so too do 58% of those with incomes below $30,000. While there has been a modest increase in the proportion of Americans who say their incomes are keeping up with the cost of living, these perceptions continue to be deeply divided along socioeconomic lines. Nearly three-quarters of those with postgraduate degrees (72%) say either that their incomes are keeping pace with the cost of living (57%) or are rising faster than living costs (15%). The shares saying they are staying even or getting ahead financially declines among those with less education. For those in households earning $30,000 or less annually, the feeling of falling behind financially is widespread. Fully 68% of lower-income households think their family’s income is falling behind the cost of living; just 31% say they are staying even or getting ahead. A majority of those with incomes of $30,000 to $75,000 (54%) also say they are falling behind financially. But fewer of those with incomes of $75,000-$99,999 (38%), and $100,000 or more (23%), say the same. A majority of 18-to-29-year-olds (63%) say their family’s income is staying even with or rising faster than the cost of living, while 36% say they’re falling behind financially. On the other hand, 60% of those older than 50 think their family’s income is falling behind. Since 2008, perceptions of local job conditions have followed a fairly similar trajectory as views of the national economy. Currently 41% say there are plenty of jobs available in their community, while 53% say jobs are difficult to find. This is little changed from May, when 40% said plenty of jobs were available. But prior to that, it had been more than seven years since as many as four-in-ten Americans said jobs were plentiful locally (41% in November 2007). Perceptions about the availability of “good jobs” remain somewhat less positive: 33% say there are plenty of good jobs in their communities. Still the share saying good jobs are available has risen modestly since August 2014 (from 26%), and has more than tripled since 2009 (from 10%). Young adults are more likely than older people to say plenty of jobs are available: 47% of those younger than 30 see jobs as plentiful, compared with 37% of those 50-64 and 34% of those 65 and older. The differences are similar in perceptions of the availability of good jobs. College graduates (52%) are about as likely as those with postgraduate degrees (48%) to say there are plenty of jobs available. But college graduates are 12 percentage points less likely than postgrads to see good jobs as available (45% vs. 33%). Smaller shares of those with less education have positive perceptions of both the availability of jobs generally and good jobs. About three-quarters of the public overall (73%) favors raising the federal minimum wage from its current rate of $7.25 an hour. Just 24% oppose an increase. Those who support raising the minimum wage were asked, in an open-ended format, to name what the wage should be instead. Two-in-ten (20%) say the federal minimum wage should be higher than its current rate of $7.25, but less than $10.00 an hour. Nearly four-in-ten (40%) name a rate between $10.00 and $14.99 an hour. 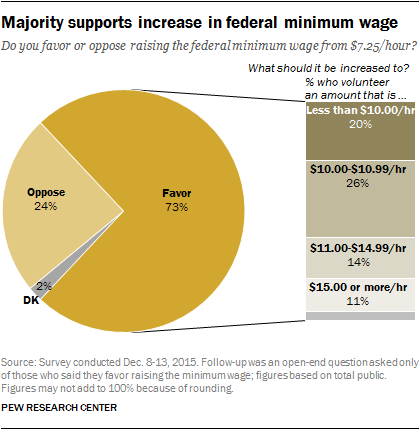 Relatively few (11%) say the minimum wage should be raised to $15.00 an hour or more.